Despite the two Koreas’ efforts to declare an official end to the Korean War within the year, it is unlikely to be achieved without significant measure for denuclearization by North Korea, analysts said. A day after a meeting with North Korean leader Kim Jong-un, the South’s National Security Office chief Chung Eui-yong said Thursday that both parties had reiterated their pledge to adopt the end-of the-war declaration as a trust-building measure to ease decades-old animosity. 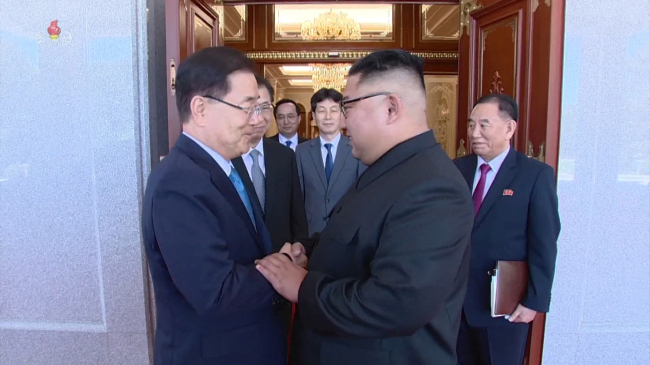 Kim reassured the South Korean envoy that the declaration would not lead to the withdrawal of 28,500 US forces stationed in South Korea -- a major concern for security policymakers in Washington. “The declaration has nothing to do with weakening the South Korea-US alliance and withdrawal of US forces in South Korea,” Kim was quoted as saying by Chung. However, analysts say that Kim’s assurance is not enough to change Washington’s reluctance to declare an end to the Korean War, a symbolic measure to ease North Korea’s security concerns until the armistice agreement is replaced with a peace treaty. While North Korean leader Kim described to Chung his decision to dismantle nuclear and missile test facilities as “a pre-emptive measure for good faith,” experts said those measures fall short of meeting Washington’s expectations. “Washington’s resistance to the end-of-the-war declaration is not as strong as before. Some even believe it could make such concessions,” said Ko Myung-hyun, a researcher at the Asan Institute for Policy Studies, who recently met with US security officials and experts. Experts also noted adopting the declaration would deprive the US of major leverage against North Korea during the denuclearization process, given the mounting criticism in Washington that President Trump has made too many concessions. After his summit with Kim in Singapore, Trump abruptly accepted Kim’s demand that Washington should stop its joint military exercise with South Korea. Defense Secretary Jim Mattis said last month there would be no more halt to any more exercises. The decision has prompted Trump to use the declaration as the only way to mount pressure on North Korea’s denuclearization, as other measures, such as sanctions relief, requires congressional approval.